08h30 Check out of hotel. Luggage collected by Shongololo staff. Full-day tour of Cape Town. 14h30 Transfer to the train at Cape Town Station. 16h00 Train departs Cape Town for Worcester. Our city tour commences with a walk through the Company Gardens, followed by a visit to the Bo-Kaap Museum. The first Malays arrived in the Cape as political refugees and slaves during the 17th century. Nearly two centuries after emancipation, these Islamic people moved into the area known today as the Bo-Kaap, building mosques with picturesque minarets and their own Georgian-style houses with Dutch influence. One of the oldest Cape Town buildings houses the museum which is furnished as a Muslim house of the 19th century and documents the history of the Cape Malays. On our way to the Victoria & Alfred Waterfront, we will stop at Diamond Works, where you will follow a tour of the diamond cutting studio, a jewellery manufacturing workshop, a jewellery design studio as well as a gemmological laboratory. Our lunch stop will be at the Victoria & Alfred Waterfront, a development that has brought new life to the old harbour of the Dutch East India Company in Table Bay. The complex offers shops, craft markets, restaurants, taverns, cinemas, theatres as well as great views over the harbour. In the afternoon we will drive through District Six, named the Sixth Municipal District of Cape Town in 1867. Originally established as a mixed community of freed slaves, merchants, artisans, labourers and immigrants, District Six was a vibrant centre with close links to the city and the port. By the beginning of the 20th century, however, the process of removals and marginalisation had begun. The first to be forced out were Black South Africans who were displaced from the District in 1901. As the more prosperous moved away to the suburbs, the area became a neglected ward of the city. On 11 February 1966 it was declared a white area under the Group Areas Act of 1950, and by 1982, the life of the community was over. More than 60 000 people were forcibly removed to barren outlying areas aptly known as the Cape Flats, and their houses in District Six were flattened by bulldozers. The District Six Museum, established in December 1994, works with the memories of the District Six experience and with that of forced removals more generally. 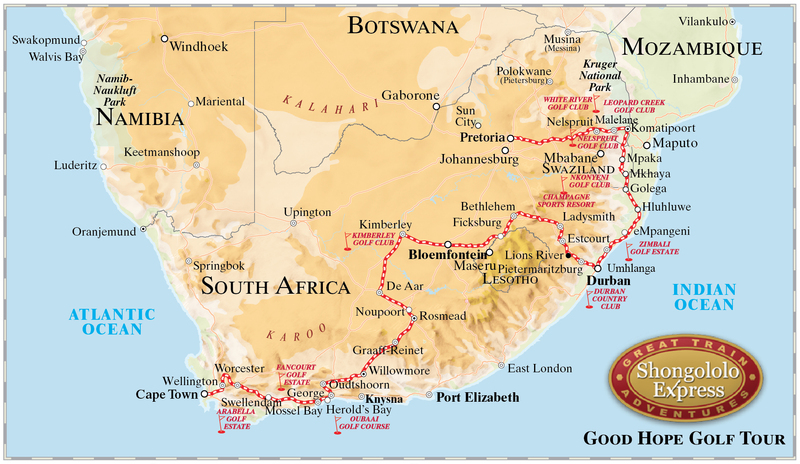 09h00 Drive the scenic route to Hermanus (120km). 15h00 Return to train at Worcester and depart for Voorbaai for the overnight stop. We travel over the Rooihoogte and Floorshoogte passes via the Overberg towns of Villiersdorp and Botrivier to Hermanus, once a renowned fish market and whaling station. The whale hunts were stopped by international treaty in 1935. The WWF includes Hermanus in its list of 12 best whale-viewing sites in the world, but it tops the list when it comes to land-based whale watching from the town’s natural cliffs and in season (normally between July and November) whales can be seen from as close as 5 metres away. 09h00 Transfer to Knysna with a lagoon ferry ride to Featherbed Nature Reserve OR enjoy shopping. 18h30 Dinner at Fancourt Golf Estate. Overnight George. 09h00 Transfer to Ernie Els Oubaai Golf Club for tee off. Return to train in the late afternoon. 09h00 Drive the Outeniqua Pass to visit the Cango Caves. Afternoon visit to an ostrich farm. 15h30 Board train in Oudtshoorn. Depart for Graaff Reinet. 09h00 Tee off at Fancourt Golf Estate. 14h00 Drive the Outeniqua Pass to Oudtshoorn. 09h00 Enjoy a guided walking tour of Graaff Reinet. 11h00 Return to train and depart for Kimberley. Tucked into the bend of the Sundays River, the Karoo town of Graaff Reinet was established in 1786 and is the fourth oldest settlement in South Africa. It’s a stylish town with at least 200 historical buildings, restored pre-Victorian homes in almost every street and a collection of museums and galleries celebrating its past. 9h00 Visit to the Big Hole and Diamond Museum. 17h00 Return to train and depart for Bloemfontein for the overnight stop. 17h00 Return to train and depart for Ladysmith. Bloemfontein is the seat of the South African judicial system. At the end of the 19th century it was also the capital of the old Boer Republic of The Orange Free State. Visit the Women’s Memorial at the Anglo Boer War Museum. This monument is a reminder of life in the concentration camps and commemorates the 27 000 women and children who died in these camps. The Museum itself is a graphic depiction of the hardship endured by all during the war and relates the history of South Africa from 1652. We then take an orientation drive through Bloemfontein, capital of the Free State Province and also known as the Rose City. Our lunch stop is at the Loch Logan Waterfront, next to the city’s newly renovated stadium, one of the venues during the 2010 Soccer World Cup. In the afternoon we drive up to Naval Hill which presents several beautiful panoramic views of the city. We end the day at the former State President’s residence “Olivenhuis”, which now houses an extensive collection of South African art. The gardens offer a relaxing atmosphere to round off the day before returning to the train. Distance travelled: ±50km. 17h00 Return to train and depart for Durban. Trace the course of the Anglo Boer Wars at the Siege Museum in Ladysmith. Wagon Hill is where both the South Africans and British suffered heavy losses and was subsequently declared a National Monument in 1938. Visit Spionkop and walk in the footsteps of three great leaders, Winston Churchill, Mahatma Gandhi and General Louis Botha. A story on which the sun never sets. Britain marched into the South African war in the spring of 1899, confident that it “would all be over by Christmas!” The war lasted three years and was to become the most costly Britain had ever fought. Distance travelled: ±180km. 17h00 Return to train and depart for Empangeni. 16h30 Return to train. Depart from Durban for Empangeni for the overnight stop. 18h00 Board train and depart for Hluhluwe. iSimangaliso Wetland Park covers over 600 000 acres from St Lucia in the south to the Mozambique border in the north and has spectacular diversity. Declared a World Heritage site in 1999, the park covers a mosaic of landforms that have created a vast array of biomes to support a wide variety of animals, plants and birds. The park boasts the highest bird count in all of Africa, the southern-most breeding spots for turtles in Africa, Africa’s tallest forested dunes, the largest remaining stands of sand forest and the biggest peat beds in the Southern Hemisphere. Visit Bushlands and DumaZulu Cultural Village situated in the heart of Zululand, near Hluhluwe. “Thundering Zulu”, the direct translation of DumaZulu, is an appropriate name for a place rich in African culture. 15h00 Board train and depart for Mpaka, Swaziland, where border formalities take place. 16h00 Rejoin the train at Mpaka and depart for Malelane. 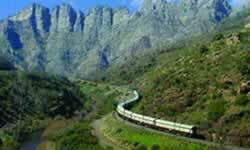 16h00 Rejoin the train at Mpaka and depart for Malelane for the overnight stop. 17h00 Rejoin train in Nelspruit and depart for Witbank. 17h00 Rejoin train in Nelspruit. 19h00 Depart for Witbank for the overnight stop. 10h00 Arrive at Rovos Rail Station. Check out of train. Luggage delivered to hotel by Shongololo staff. Full-day tour of Pretoria/Johannesburg and Soweto. Soweto comprises one-million people and was made famous by the Apartheid laws. We pass the Chris Hani Baragwanath Hospital (the largest hospital in the Southern Hemisphere) and also drive past the only street in Africa that once housed two Nobel Peace laureates, Archbishop Desmond Tutu and Nelson Mandela. We visit the Hector Petersen Memorial, named after one of the first students to be killed in the 1976 uprising against the Apartheid government.